Ta-dah! Finally pictures of the scrappy, rainbow quilt that has been in the works since Christmas. A full-body shot. I am SO happy with how this quilt turned out. It’s kind of a step away from my usual primary color palette. You can see the original progress on this quilt here and here. All the pieced portion of the quilt was made entirely from scraps. So that makes it a mostly free quilt, right?? A lot of the scraps are leftovers from cutting the kits for the Soul Blossom quilt last spring. With such a loud front, I wanted to choose a print for the back that would be equally loud and cheerful. This fabric is from Dena Design’s Taza collection for Free Spirit. I choose a tangerine-y binding because I’ve been digging orange for a while now. I used Jenean Morrison’s Silent Cinema – also for Free Spirit. I ran out with only a small chunk left, so I used some leftover Deena Rutter Happier Strip to finish. I like it. This pattern includes sizes: Baby, Twin, Throw (same as mine 80″ x 80″), Queen, and King. Woo! (and Whew!) The pattern is $9.00 and available for instant download by clicking on the Buy Now button. It is also available in my Etsy shop. What a happy quilt!! Need to add this pattern to my wish list. Lovely work. Awesome job, Amy, it looks great! That is like the block I am making my scraps into to. It is a great scrappy pattern. Oh Amy! What a &quot;happy&quot; and pretty quilt! :o)<br />You did such a beautiful job!! what a fantastic pattern! Who wouldn&#39;t want to wake up to those bright colors every day? I love it. Lovely quilt! I love the way that the colours blend into each other. I really like it Amy! It&#39;s out of my usual color zone too but it just screams summer fun! Wow, that is one pretty quilt! It is definitely on my &#39;to do&#39; list. Very nice quilt, Amy! I do love the backing you chose!<br /><br />Congrats on the pattern too! Oh, it&#39;s so lovely! What a great use of scraps! Wonderful quilt. Truly drool-worthy! Do you mind if I pin it on Pinterest for future reference? This is just absolutely delightfully beautiful! This is a quilt that will always make you smile! =) LOVE it! This is absolutely beautiful.Great job! I love it! Especially the orange in the back and binding. Oh Amy. It is gorgeous. I am totally in love with it. You did a beautiful job. Gorgeous! and I love the name, and the backing, and the binding. I agree, such a happy beautiful quilt! I love the rainbow of colors without it looking like a rainbow… If that makes any sense. ;-). You do beautiful work! It looks absolutely fabulous! I love the scrappy-brightness of it! Hooray! It&#39;s gorgeous! I also love that the rainbow is broken up and quite subtle. It&#39;s not your typical pot-of-gold rainbow. It&#39;s quite grown up, and still a little whimsical. Beautiful job. It&#39;s gorgeous! I will have to get the pattern! The crazy wild prints are perfect. It&#39;s beautiful! I love all the crazy patterns together! What a fabulous scrap quilt! Love your binding and backing too! Your Rainbow Quilt turned out perfect! Just crazy about the bright splash of color on that back! Wonderful! I love your rainbow quilt. Well done. 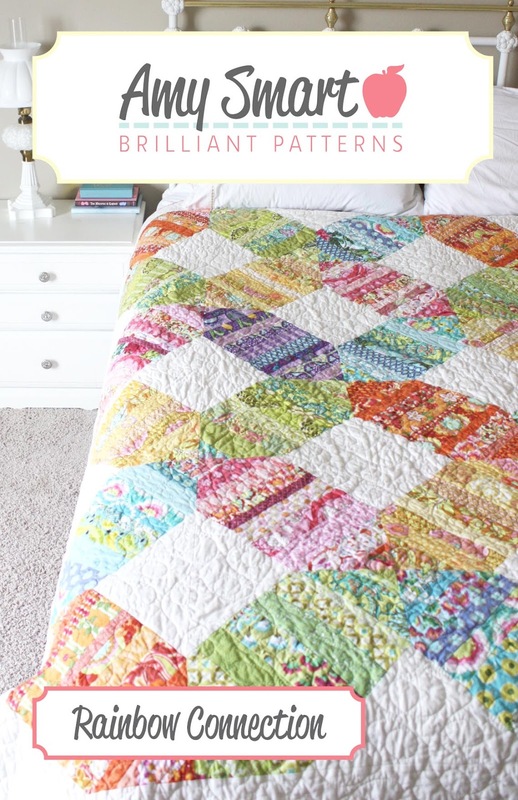 It&#39;s a gorgeous quilt because it is like a classic old family heirloom and yet it is contemporary and bright. Well done! Absolutely beautiful. Would this pattern be appropriate for a novice quilter or is it more advanced?? That is a beautiful quilt! And quite fittingly colorful in time for Easter weekend. Beautiful! I love the pretty colours and the backing has a gorgeous 70s vibe! Silent Cinema is gorgeous and the binding is lovely 🙂 mmmm tangerineness! Happy Easter Amy! So pretty and happy! Love it! GORGEOUS! Definitely pinning this for future inspiration! Absolutely beautiful! Love the colors you chose. What a great way to use up scraps! And the backing is perfect! This is the next on my list and it is because of the name. Rainbow connection is my favorite muppet song!!! My husband looked at your quilt and said this is a must have and when I saw the name, that was instant permission to buy more fabric 🙂 thanks for the motivation! This looks great! So light and summery! That is a really wonderful quilt. I love it, not only because it is gorgeous but it is my favorite color scheme. I love the way this came out and it&#39;s going on my to-quilt list for sure! Great job! I love the colors..Very pretty quilt! Very sweet! It just sings &#39;spring&#39;!! Amy, this is indeed a Brilliant pattern. I love the quilt, and I think the name Rainbow Connection is perfect. Love. Love. Love it! Congrats on a finished quilt and pattern! It is beautiful. I only hope I can make a quilt as good as this. beautiful, beautiful, beautiful! such a lovely way to incorporate the rainbow into a quilt. This is absolutely gorgeous, Amy! Wonderful job, a rainbow of smiles to look at every day :). Enjoy it! It&#39;s Beautiful Amy — Congratulations!!! I love the colors…this is beautiful! Fantastic Finish! I am always so inspired with your lovely creations. Its a beauty Amy. Congratulations on your latest pattern release. I love your colour choices (front &amp; back). Wow,it looks beautiful and I specially like the orange binding! Amy, I&#39;ve been looking for the perfect quilt for my Soul Blossoms fat quarters and lots of other fabrics. This is it! I already purchased the pattern and I have 8 blocks completed. I LOVE the way they&#39;ve turned out. Thanks for such a great pattern. I&#39;m in love – love the stripieness (is that a word? ), love the happiness, love it all.